Toilets are provided throughout the terminals at Heathrow Airport, both in arrivals and departures. 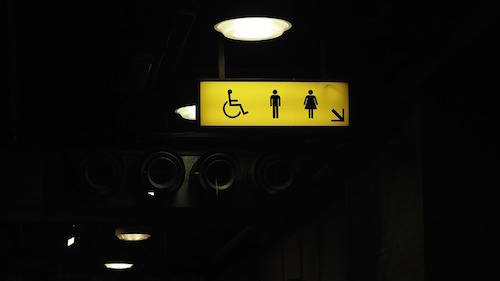 There are also unisex wheelchair-accessible toilets available. Toilet locations: Check-in, Level 5: Toilets are located on both sides of the check-in area covering Zones A, B, C and D, both of these have baby care facilities. Departures, Level 5: Toilets with disabled and baby care facilities are located either side of the exit from Security. Departures, Level 4: Male, female and disabled toilets, and baby changing facilities are available throughout Departures, including Terminal 2B. Arrivals, Level 1: Toilets with disabled and baby care facilities are located in the baggage reclaim area opposite carousels 2, 3 and 9, and next to the M&S Simply Food and Caffé Nero in the Public Arrivals area. 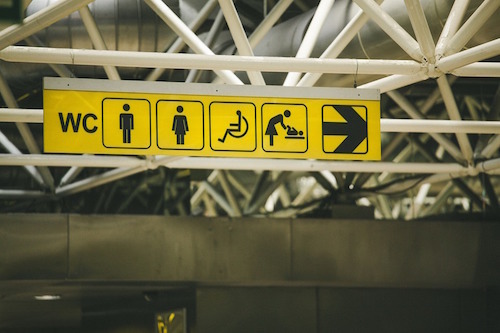 Toilet locations: Check-in, Ground Floor: Male, female and disabled toilets are located in check-in zone B and between zones F and G.
Check-in, Level 1: Toilets are at each end of the building, with disabled and baby care facilities in both. Departure Lounge, Level 1: Toilets are at each end of the lounge, with both having disabled facilities and the ones near Ted Baker having baby care facilities. Arrivals, Ground Floor: Toilets with baby care and disabled facilities are located in the baggage reclaim opposite Carousel 4 and 9. Also available in the public area of the arrivals concourse, on the side nearest Arrivals and furthest away from the public entrance. Toilet locations: Check-in, Level 2 and Mezzanine: There are toilets either side of security, and these have disabled and baby care facilities. There are also toilets near Zone G, however these do not have any baby facilities. You will also find toilets on the mezzanine level. Departure Lounge, Level 2: Toilets are centrally located on either side of the main WorldDutyFree shop, as well as some towards Gate 11, next to WHSmith. Arrivals, Ground Floor and Mezzanine: There are toilets on either end of the Baggage Reclaim hall, and also in Arrivals next to WHSmith and near the escalators to the Underground. All of these have disabled and baby care facilities. Toilet locations: Check-in, Level 3: There are three sets of toilets, all with baby care facilities and disabled access, spread evenly throughout the area. Departures, Level 3: There are five toilet blocks available in the departures concourse: three before security (throughout the concourse) and two after security (next to Huxleys and HMV). Departures, Level 2: There four blocks here, all equipped with disabled and baby care facilities and evenly spread throughout the concourse. Terminal 5b: There are two toilet blocks located at either end of the building, both with disabled and baby care facilities. Arrivals: There are four toilet blocks in the arrivals concourse, two before security (either end in the baggage reclaim area) and two after security (near M&S Simply Food and in the seating area).